… the juices in this dish are the most glorious pinky red colour and would look amazing on mashed potatoes or rice. eat and of course, enjoy! Oh! And such a pretty dish too! 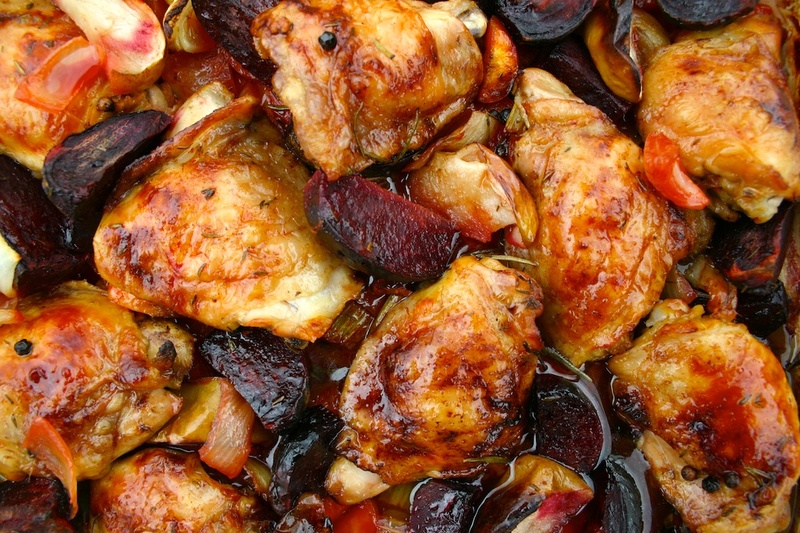 SB loves beets … and I love SB … therefore … perhaps I'll show him a little thigh love too! I loved pickled beets as a child and grew into orated as an an adult. Paired with the chicken they would be heaven on a plate. yum yum..looks moist and tender. Oh my this looks outstanding!! I will be making this one soon. I'll even include beets, though they're not my favorite. Like you, a little maturity in the taste buds and finesse in cooking has made a beetroot believer of out me, which is saying a LOT! A little funny story, a few years ago I saw a chef make crimson mashed potatoes. Beetroot cooked w the potatoes and all mashed together. It was beautiful. I became obsessed with making this dish, and grew my own beets just for this recipe, thinking that if I dislike store bought beets (which I do) then maybe I'll like homegrown. Turns out I didn't like the homegrown variety anymore than store bought and I never made those stinking potatoes. It's only been since then that I've come to appreciate what the beetroot can bring to the dinner plate. And yes, the day after toilet shock is, well, shocking! Great recipe, thanks for sharing it! Oh my…..this looks amazing!! So sticky and sweet but earthy and robust at the same time! How I wish I could put my hand through my computer screen and grab the entire dish! 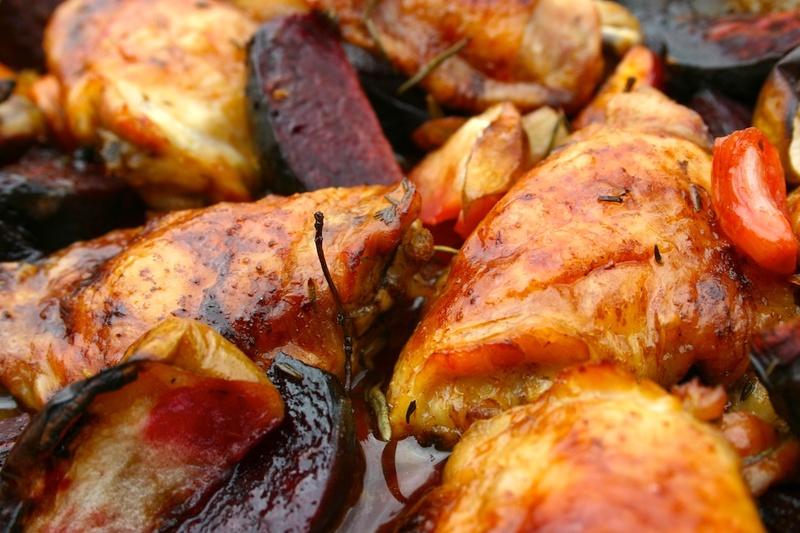 Yay for the return of chicken thighs – you are the master! Lovely flavours here. I know lots of people who hate beetroot, but I love them. The colour is just part of life. Actually I'm glad you posted a beetroot recipe (with more to come…?) because I still have lots of beetroot left in my garden which need using up before we get frosty weather. Oh oh and ooh, what a lush if a bit unusual combination of ingredients! Adore beetroot in any form! looks delicious! Oh I wish I had neighbours who grew lots of stuff – especially beetroots and roasted beets have such depth. Shame about the trip to Argentina but hey congratulations 2nd is not bad either you just need to campaign harder next time. Ah, my delightful children only eat beetroot for the toilet bowl shocking pigment! Your thighs are stunning! Seriously, this looks like a truly delicious Autumn dish! Stunning, stunning, stunning! I think you may have converted to me to beetroot! beautifully done chicken. I love the colour and it must taste great! I love roasted beetroot. I wish someone would leave some on my doorstep! Possibly unlikely, living in a big city, but then again I do occasionally get courgettes from friends' gardens and allotments, and was given some great runner beans and late rhubarb this week. We also have figs in our tiny garden, and an apple tree opposite which we are welcome to pick from any time. Just waiting for them to appear this year! Also, I do sometimes leave cakes on my neighbours' doorsteps! Enjoy making the most of those lovely beetroot. Are you going to try something sweet perhaps? Yum! This is like a chicken thigh version of my beetloaf, brilliant! Great recipe. I am assuming the wine goes over the chicken, and is not just to accompany the cooking process? A little omission in the directions, perhaps? But an amusing one! Boy Dom, you get such great browning on all your thighs. I'm wondering if my oven temperature might be a little off. These look great.